Blackjack bonuses tend to be less substantial than the signup promotions for pokies, video poker, and most other casino games. Many casinos list blackjack among their exclusions in their wagering requirements, or apply contribution percentages of around 2% compared to 100% for the slots. Many people have to play the slots just to meet their bonus requirements, which should tell you what the casino owners who see the numbers think about your chances playing the virtual slot machines. We want to show our overseas readers where to find the best blackjack bonuses. The last thing gamblers who enjoy twenty-one want to do is play several hours on the poker machines just to meet their play-through requirements. We’ll take you through the bonus offers available at our favourite blackjack sites and how to use these to your advantage when playing online for real money. All casino games have what’s called a “house edge”. This is a calculation of your probabilities of winning or losing, described as a percentage. The percentage describes how much the casino expects to win from you every time you play. The higher the house edge, the worst your chance of winning. A game with the biggest payout tends to have the largest house edge. Lottery gaming has the worst house edge, with the lotto companies expecting to collect revenue on 30% to 40% of all the money wagered. Keno, a lottery style casino game, is next worst with a 20% to 30% casino advantage in many locations–but as long as 4% in a few areas. Pokies or slot machines are next, with a common house edge in the range of 5% to 15%. Blackjack, on the other hand, has a house edge of less than 1%. Of each $100 you wager, you can expect to lose less than $1 of that money. The reason is blackjack has a low payout, only 1 to 1 for average wins and 3 to 2 for natural twenty-ones. Because the casino doesn’t expect to make much money offering blackjack players a game, they aren’t going to give out as much of a welcome bonus to those gamblers. Real money players should gamble at the Microgaming casinos. These sites license Microgaming software, which is designed by the leading company in the business. Using this particular developer means the casino can offer over 500 games, which have cutting edge graphics and sound quality, entertaining themes, and the most popular games. More important for gamblers, all Microgaming casinos are members of eCOGRA, which assures fairness and transparency in gambling. If you’re going to put your money in an offshore gaming account, you need to be able to trust the operator. With that in mind, let’s take a look at some of the blackjack bonuses in the leading Microgaming online casinos. Blackjack games at All Slots contribute towards 8% of the welcome bonus wagering requirements, excluding Classic Blackjack. Start playing at All Slots today to claim up to $1600 in welcome bonuses. Free beer – need we say more?! G’day Casino is so dedicated to offering good old fashioned hospitality that players making an initial deposit of more than $100 will be sent out a free slab of beer. And that’s just the start of it! Simply following our links to register for an account with G’day Casino will award you with 50 free spins on the South Park Reel Chaos pokies game with no deposit required, plus an ongoing deposit bonus of 10% on every deposit made. Upon making your first real money deposit at G’day, players receive a 100% matched deposit bonus up to an unlimited amount plus up to $500 on the subsequent second and third deposits. The downside of these huge bonuses is that blackjack games at G’day don’t count towards the wagering requirements, so you’ll have to play other casino games to take full advantage of these offers. Sign up at G’day Casino and receive free beer and a 100% matched deposit bonus. Unfortunately, playing blackjack does not contribute towards the wagering requirements of this bonus but if you’re partial to the pokies this bonus will suit you just fine. Sign up at Guts.com to receive up to $400 in bonus money. 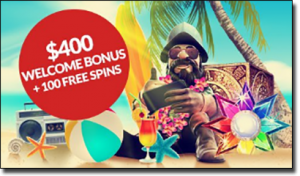 Registered players also receive access to a range of special promotional offers and casino bonuses – make sure to sign up to the email and SMS list to stay in the loop of the latest offerings. Sign up at Royal Vegas Casino to receive up to $1200 free.